Artist’s concept of the exoplanet 55 Cancri e, which may host large and active volcanoes. Image released May 4, 2015. Temperatures on a nearby "super Earth" exoplanet varied dramatically recently, suggesting that large and very active volcanoes may exist on the alien world's surface, a new study reports. Researchers using NASA's Spitzer Space Telescope found that temperatures on 55 Cancri e — a planet eight times more massive than Earth that lies 40 light-years away — swung between about 1,832 to 4,892 degees Fahrenheit (1,000 to 2,700 degrees Celsius) from 2011 to 2013. This atmospheric variability was observed on the "day side" of 55 Cancri e, which lies so close to its host star that it completes one orbit every 18 hours. The planet is tidally locked, meaning one side always faces the star and the other always faces away. The researchers said they aren't sure what's behind the huge temperature shift, but they've got a leading candidate in mind. "We think a likely explanation for this variability is [that] large-scale surface activity, possibly volcanism, on the surface is spewing out massive volumes of gas and dust, which sometimes blanket the thermal emission from the planet, so it is not seen from Earth," lead author Brice-Olivier Demory, of Cambridge's Cavendish Laboratory, said in the same statement. If this interpretation is correct, volcanism on 55 Cancri e would likely be even more intense than it is on Jupiter's moon Io, the most volcanically active body in Earth's solar system, researchers said. 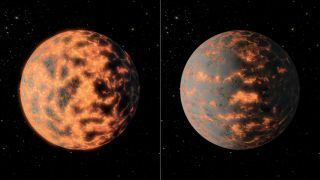 Astronomers once thought that 55 Cancri e was so carbon-rich that it was composed largely of diamond, but recent studies suggest that the planet's carbon abundance may have been overestimated. The new observations further add to the mystery and intrigue of 55 Cancri e, one of five planets known to orbit the star 55 Cancri. "The planet could still be carbon-rich, but now we're not so sure. Earlier studies of this planet have even suggested that it could be a water world," Madhusudhan said. "The present variability [in temperature] is something we've never seen anywhere else, so there's no robust conventional explanation," he added. "But that's the fun in science — clues can come from unexpected quarters. The present observations open a new chapter in our ability to study the conditions on rocky exoplanets using current and upcoming large telescopes."